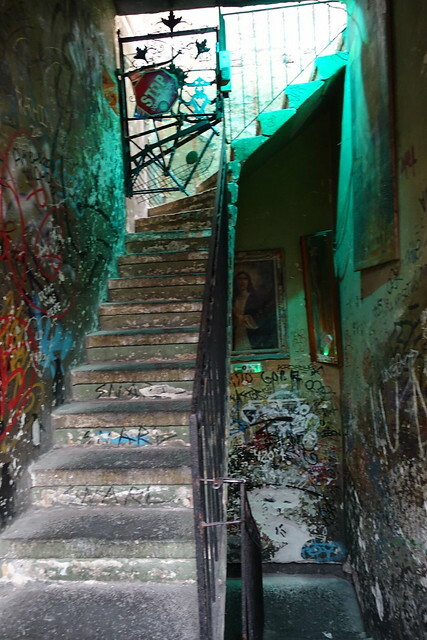 Underneath Budapest’s elegant exterior there’s a hive of youthful creativity and rebellion. 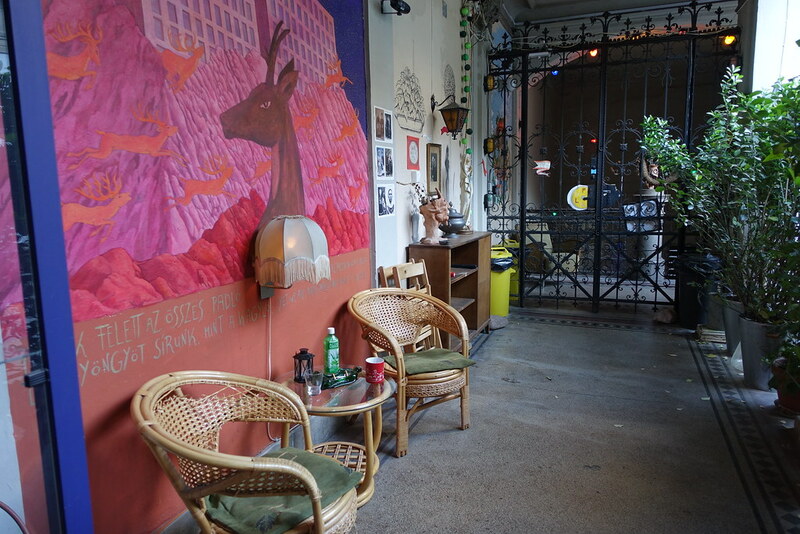 For us this came out most in the truly unique hostel we stayed in, Lavender Circus, and Budapest’s original and most famous ‘ruin bar’, Szimpla Kert. 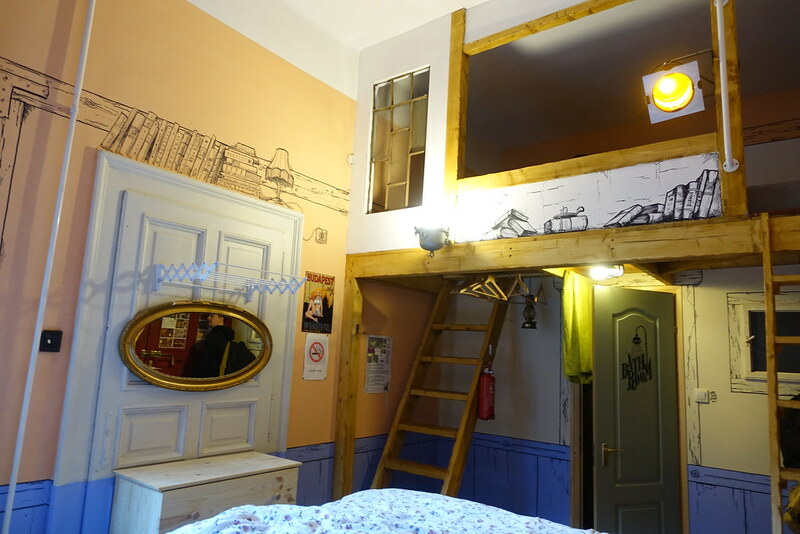 I found Lavender Circus by chance as I was browsing Booking.com for somewhere cheap to stay in Budapest. 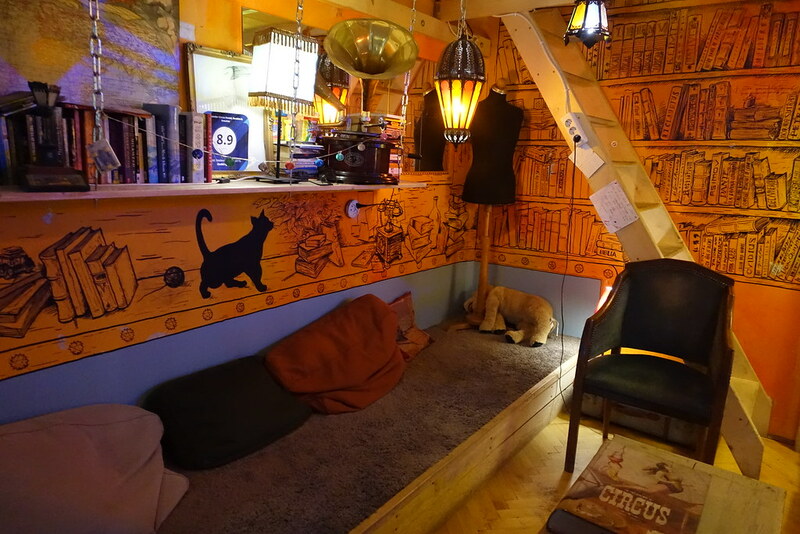 I usually overlook hostels in favour of budget hotels, but Lavender Circus grabbed my attention immediately with its quirky name and unusual photos. Its affordability ended up being just a nice bonus! Lavender Circus isn’t easy to find. 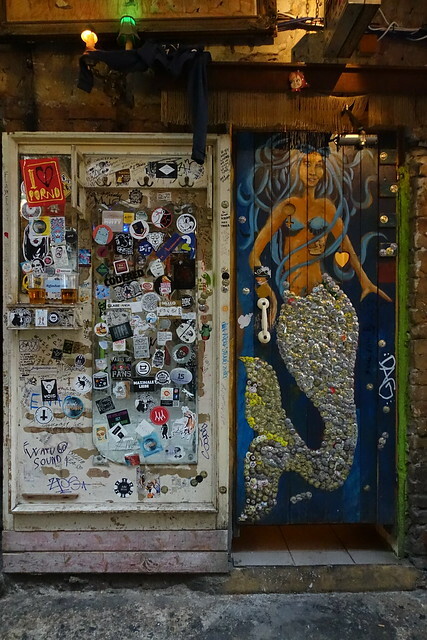 There’s no signage over the single blank door, squeezed in between shops – the only indication that you’re in the right place is the tiny label next to a number on the door intercom. 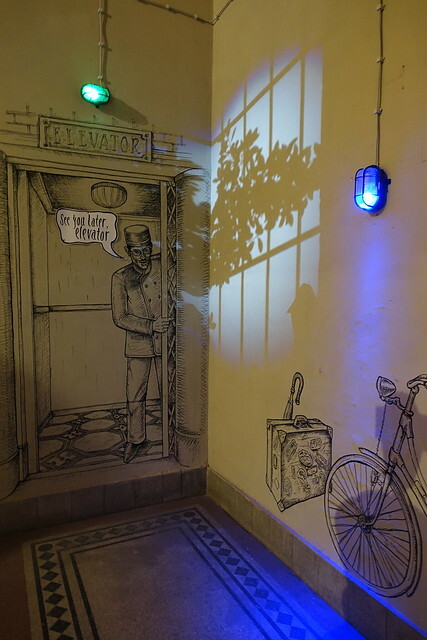 Once buzzed in, you climb two flights of stairs before finding the first illustrations on the walls – a pretend lift, poking fun at those who’d complain that there is none – showing that you’ve found it! 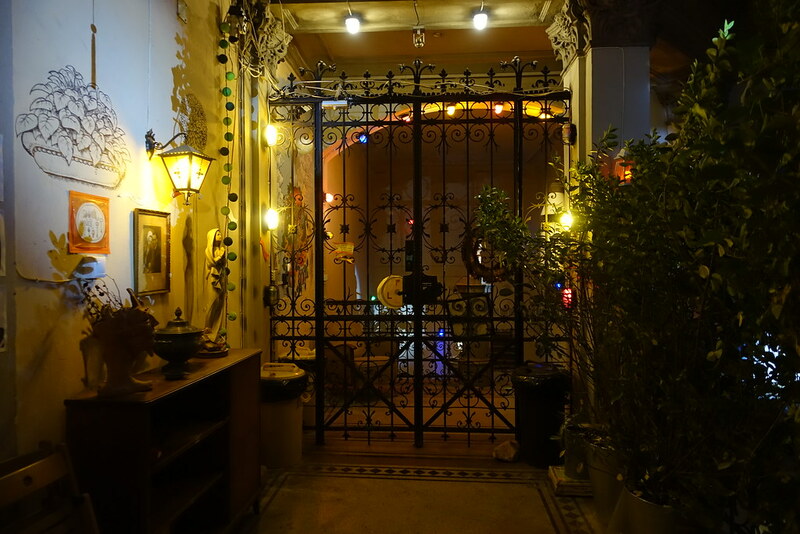 Welcomed through a gate and led over the colourfully decorated terrace, the host made us coffee as we checked in, sitting in the common room/kitchen. 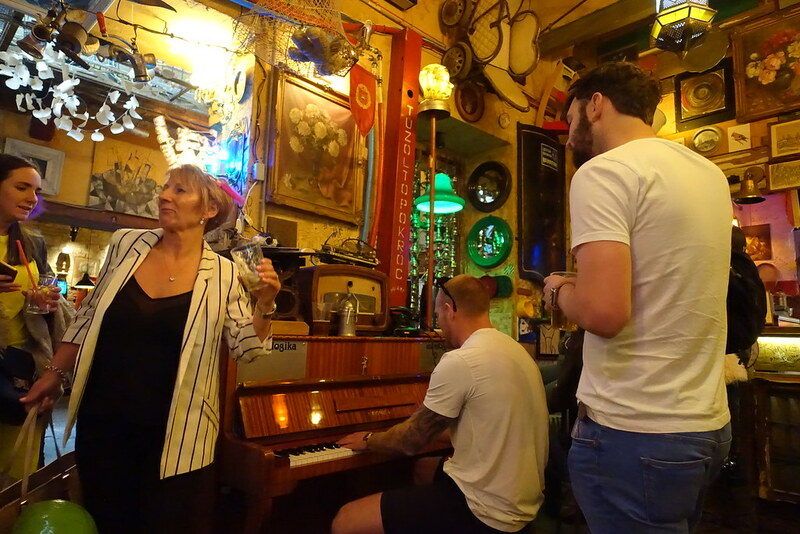 Like the rest of the hostel, the common room is rustic, cosy and bohemian in style, dressed up with a jumble of vintage objects, odd furniture and colourful fabrics. 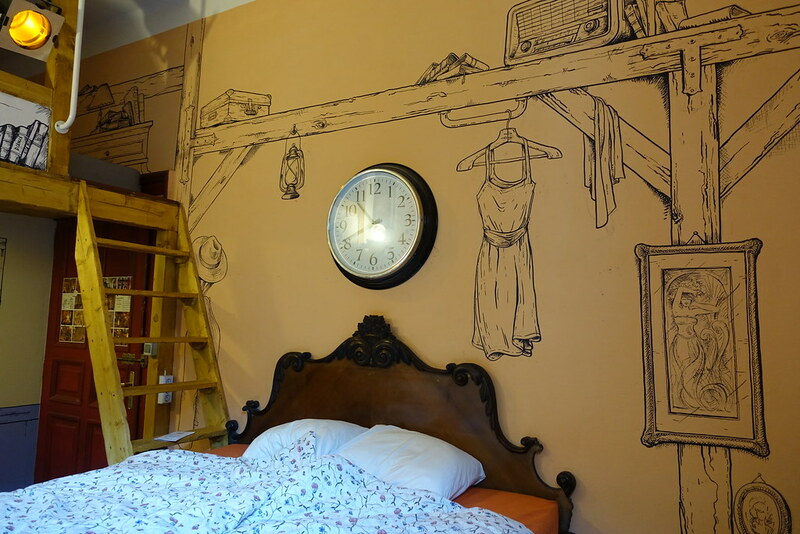 The walls are filled with quirky line drawings that create the illusion of furniture, books and cats that aren’t there. After checking in the host gave us a map and a very laidback introduction to the city, circling recommendations on the map. We had a private double room close to the common room, with a further mattress up on a mezzanine reachable by two ladders. Although our bed was on the lower level, its base was so high that I literally had to climb into it! 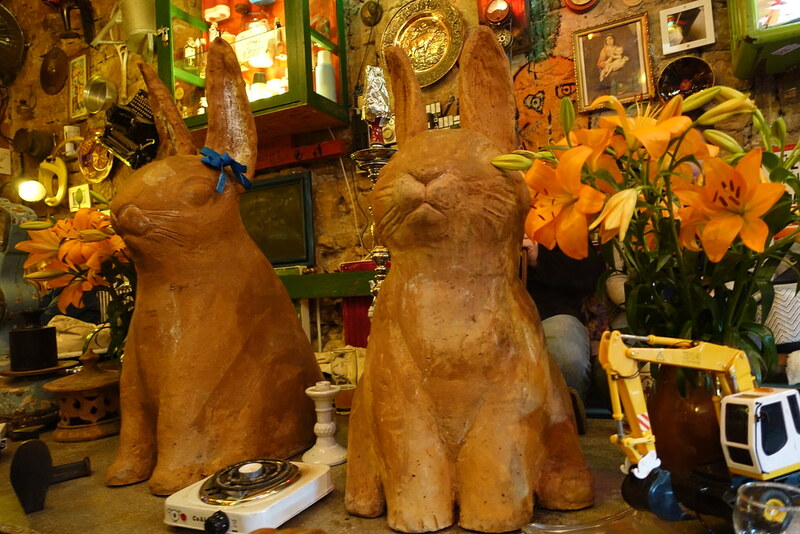 I loved the room’s creative design, odd accessories and brilliant illustrations of wooden beams, furniture, hanging clothes, paintings, lamps and books. We slept well there too, except just one night in which I was kept awake by loud talking in the common room. 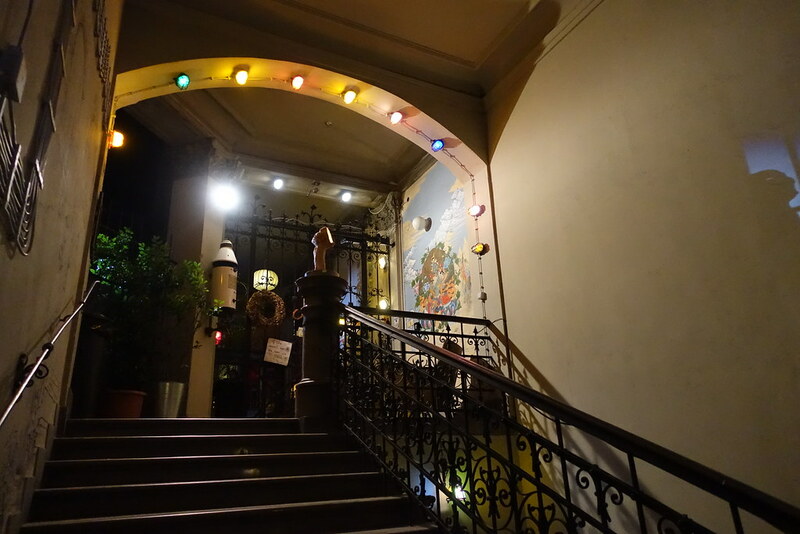 Overall, if you’re looking for somewhere cheap, central and a little bit special to stay in Budapest, Lavender Circus is the perfect choice! 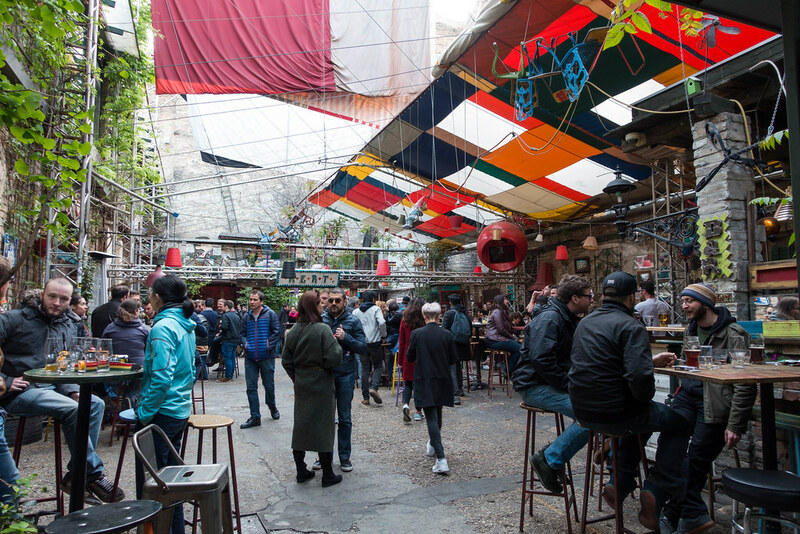 There are hipster hangouts elsewhere in the world that resemble ruin bars, but those in Budapest are the real thing. 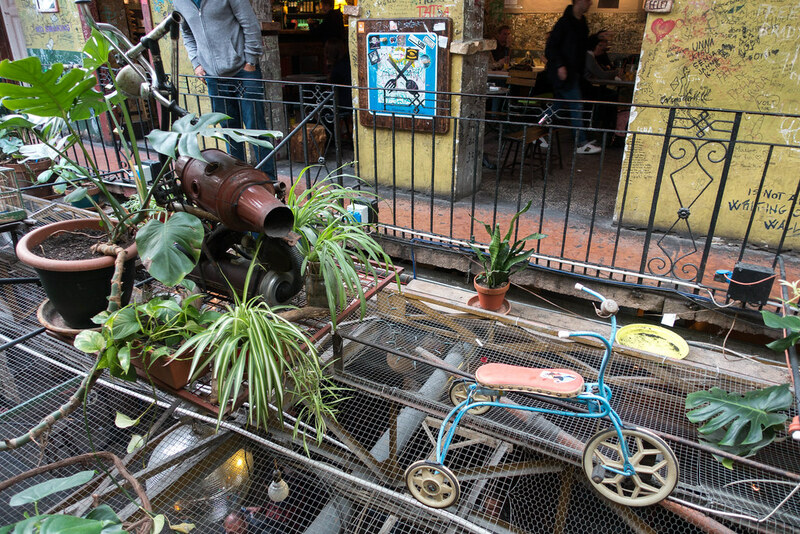 The city’s trend of turning derelict buildings into bars all began with Szimpla Kert (Simple Garden in English), which dials up the theme of dereliction to portray a mad, graffitied junkyard where you can knock back shots in a bust-up car, smoke shisha next to giant terracotta rabbits, or eat dinner surrounded by walls covered in art and people’s scrawlings. 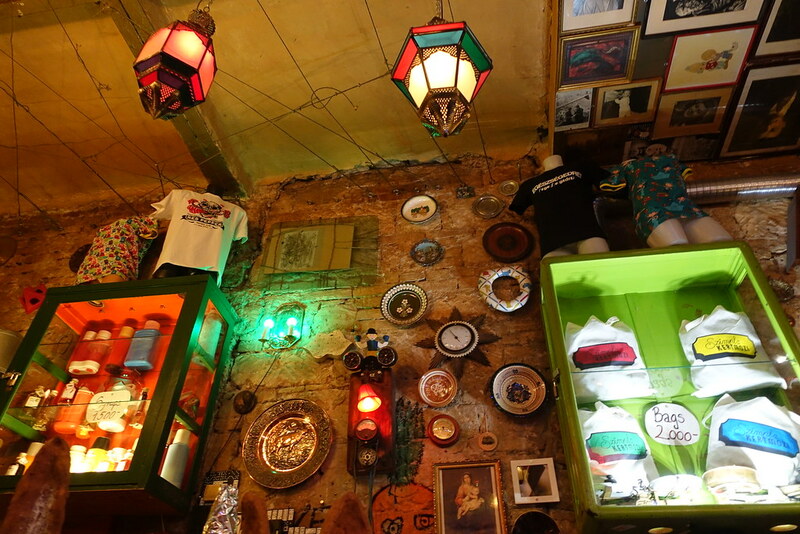 Szimpla Kert has become a tourist attraction and is therefore incredibly popular. When we tried to get in after dinner one night, we found a line out the door and a one-in-one-out policy. The next day we went before dinner (around 5.30pm) and got in no problem – and I’m so glad we did! 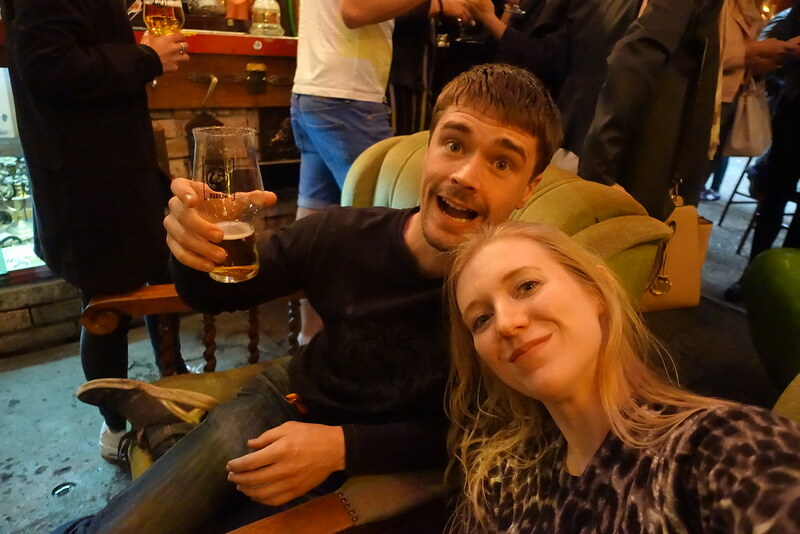 Soon after we sunk into our armchairs, someone started playing pop songs very proficiently on the piano next to us. Within minutes a huge crowd, of people of all ages and nationalities, had gathered and we were all dancing, singing along and making requests. Never before have I had such a great ‘night out’ at 6pm in the evening! 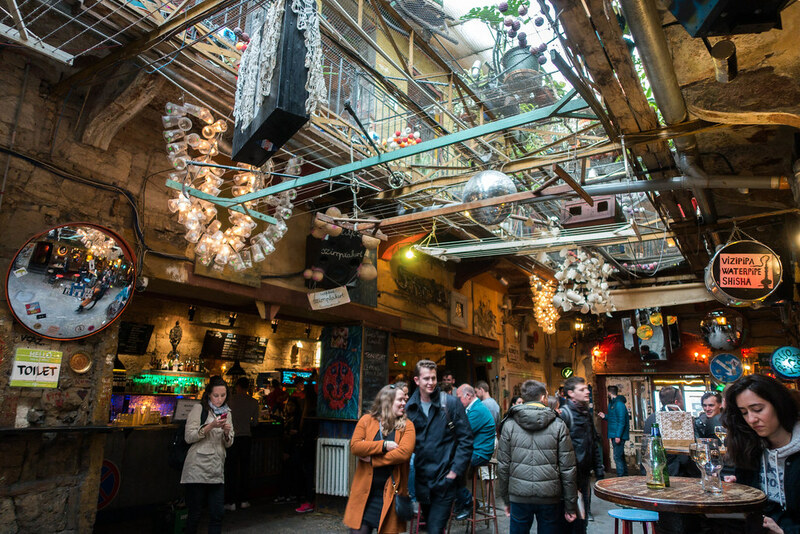 Szimpla Kert just seems like the kind of place that brings people together, and I’d recommend it to anyone as a unique bar experience in Budapest. 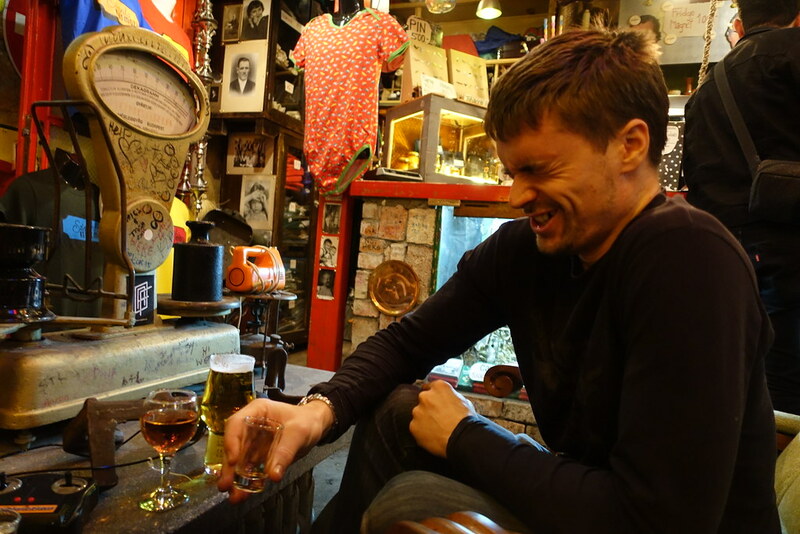 With only three days in the city, I feel that we only scraped the surface of Budapest’s creative underbelly. 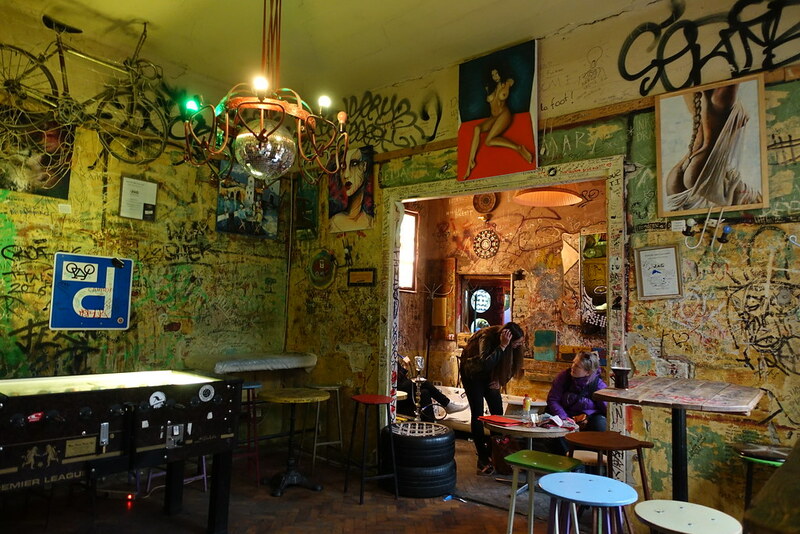 Have you visited any of Budapest’s other ruin bars, or discovered anything else cool, creative or edgy in the city? I’d love to hear about it! Stay tuned for forthcoming posts about sightseeing in the city, and about catching the children’s railway to the Buda Hills. 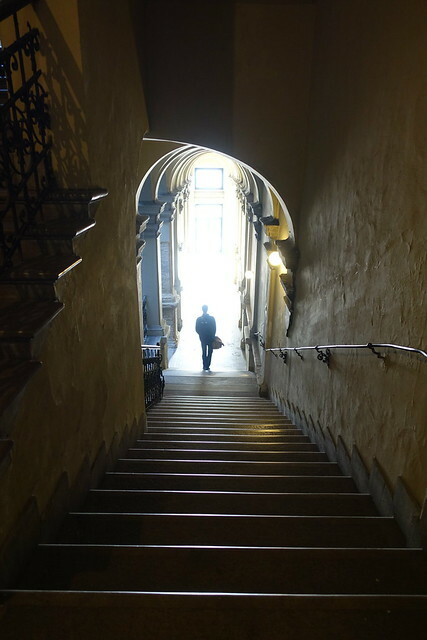 You can discover Budapest’s beautiful grand cafes here. All text and photos (c) Juliet Langton, 2017. All rights reserved. 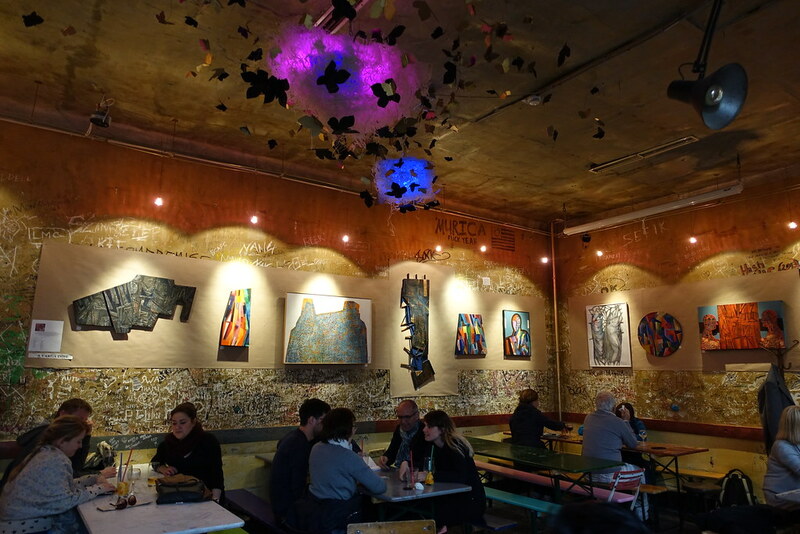 Posted in Central Europe, European cities, Photography, Reviews, TravelTagged Budapest, Hungary, Lavender Circus, ruin bar, ruin pub, Szimpla KertBookmark the permalink. Thanks! Hope you have a great time! Hope so too, first I need to survive Cairo where I’ll head to tomorrow morning….